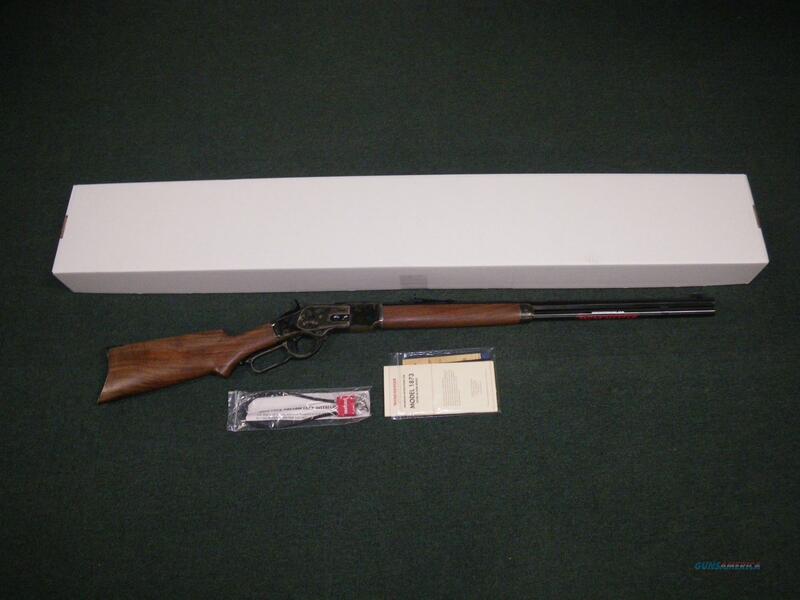 Description: You are bidding on a new Winchester 1873 Sporter in 45 Colt with a 24" octagon barrel. There is something entirely cool about a pistol grip stock combined with an octagon barrel. It has the look more of a dedicated rifleman than a working cowboy. You may love this rifle for other reasons, but the fact remains that a '73 like this is pure classic. But we have taken it a step beyond with a walnut stock with a satin oil finish that’s velvet smooth to the touch. The classic rifle-style forearm offers a timeless look and feel. Then, of course, the color case hardening on the robust steel receiver, lever, crescent buttplate and forearm cap protect against corrosion and offer the most authentic 19th century look you can get. And then the crescent buttplate is the final touch -- slipping right into your shoulder for a more solid hold from any shooting position. Displayed images are stock photos. Any questions please feel free to ask (our phone number is in the additional information tab above). •	We accept all major credit cards, certified checks or money orders for payment. •	Payment for all auctions must be received within 5 days of sale. •	We charge no sales tax on any transaction. •	A 3% processing fee will be charged for the use of a credit card. •	If you would like to place a firearm on layaway we will require a 20% non-refundable down payment and minimum monthly payments of 16% of the total sale price. •	We will only ship inside the United States, no international shipments. •	Shipments to Alaska and Hawaii pay actual shipping costs. •	All firearm sales must be shipped to an FFL holder for transfer. The buyer of an auction must make arrangements with their FFL holder. Any transfer fees that the FFL holder charges are not included in the sale price. •	The bidder of an auction must make sure that the item they are purchasing complies with their state laws. If an auction is returned due to a state law or to a failure to pass a background check, the buyer is responsible for all shipping fees and a 10% restocking fee will be charged. •	The buyer of an auction has a 3 day inspection period, if the auction is to be returned the buyer will pay all shipping fees. •	In store pickup is available for all auction sales. Please note that handgun sales must have a background check performed in the buyer’s state of residence.